Gibson London Retro 60s Mod 3 Piece Suit in Silver Donegal. Gibson London Men's Sixties Mod Donegal Double Breasted Blazer Jacket. Vintage textured wool mix fabric with Retro Donegal Fleck finish. Classic Gibson London Tailored look with Mod peak lapel and exquisite Retro Geometric pattern interior trims. A hint of 1920s Retro style fused with Ivy league era and traditional Sixties Mod inspiration. 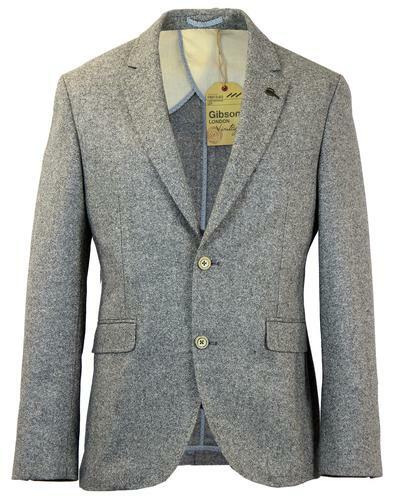 Gibson London Mens Donegal Double Breasted Blazer Jacket. Early Twentieth Century, Edwardian Peaky Blinders style, 1920's Boardwalk Empire inspiration and just a darn fine double breasted blazer jacket by Gibson London. Traditional grey Donegal Retro wool mix fabric with textured Vintage fleck finish. Featuring sophisticated tailored Mod peak lapel and side vents to reverse. 2 button double breasted fastening, Retro contrast Geo-Op Art inner piping trim, antique effect buttons and stylish under collar felt trim. 3 button non-working cuff detail. 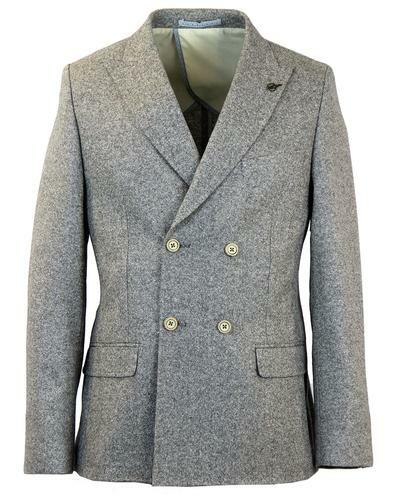 A stylish Retro wardrobe staple, the Gibson London grey Donegal Double Breasted Suit Jacket is a perfect tailored piece. Finished with removable Gibson London tailors scissors pin on left side of lapel. 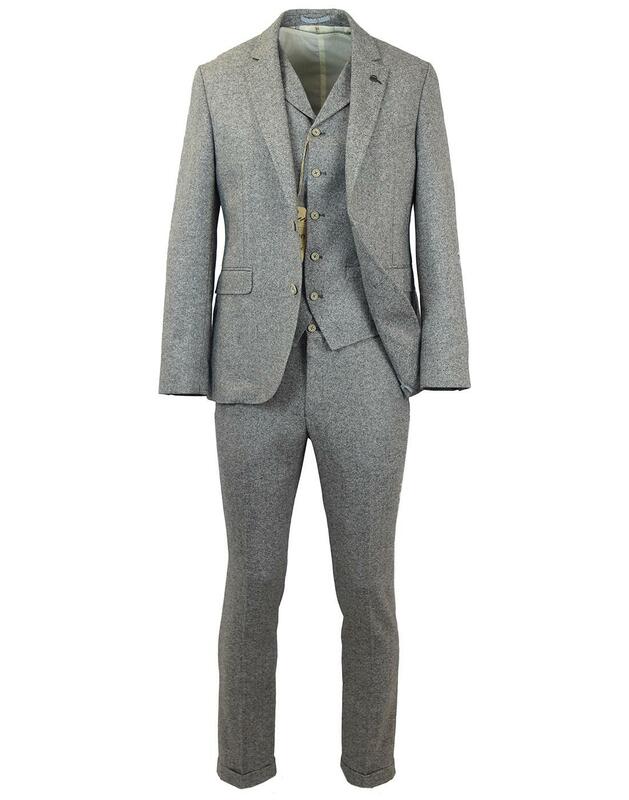 You can pair this Gibson London Mod Donegal double breasted suit blazer with the matching trousers for a sophisticated 2 piece suit (while stocks last). Key Points: Gibson London Donegal double breasted blazer jacket. Fleck fabric finish, 2 button fasten, contrast interior trim. Peak lapel, flap pockets to sides. SKU: G16117MLJ/250 Grey Donegal Double Breasted Suit Jacket. 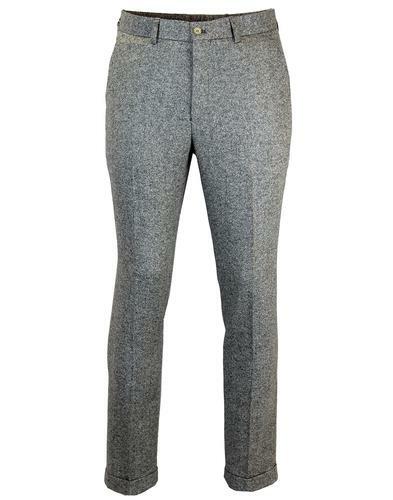 These fab Gibson London Retro Donegal suit trousers are the epitome of Vintage cool. Drawing inspiration from a host of bygone eras including the 1920's, 1950's Ivy league and Modernist culture and classic Sixties Mod style. Traditional regular cut Retro flat front trousers. Ultra smart Donegal Fleck suit trousers by Gibson London. Gibson London Mens Regular Cut Mod Flat Front Trousers in a traditional silver grey colourway. Retro textured Donegal fabric with Vintage fleck finish. Featuring stylish slanted side pockets and neat button down back pocket detail. Button fasten waist, zip fly. Classic Sixties Mod Trousers with traditional belt loop waistband - by Gibson London. 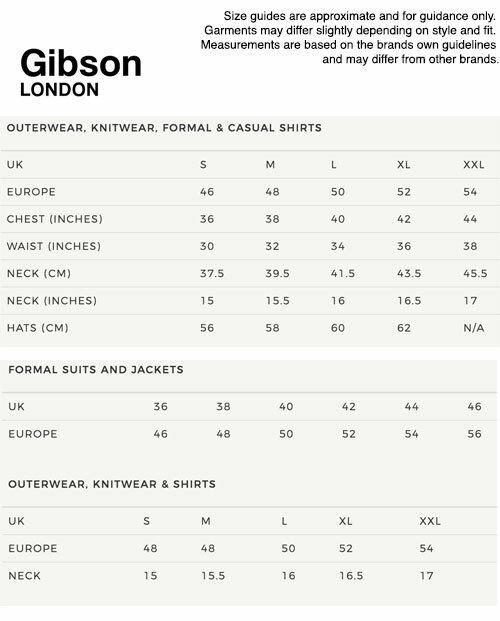 Key Points: Gibson London Flat Front Donegal Trousers. Button waistband, zip fly. SKU: G16117DNT/250 Grey Donegal Trousers.